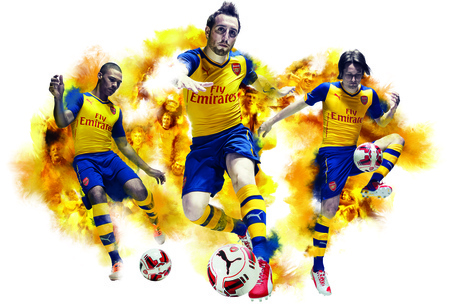 Arsenal, has been ramping up their efforts to introduce different color kits and more elaborate designs since moving to Puma in 2014. Highly Discounted Puma apparel is flying off the shelves in order to make room for all the new kits out there that Arsenal is launching! Some of Puma’s new away gear is actually really appealing, with Colors of Yellow, Blue and Red, these kits are sure to completely clear off shelves faster than anyone has imagined! The yellow/Blue kits are quite colorful, including the striped socks and body tight shirts. Could Arjen Robben (of Bayern Munich) have anything to do with the styling of these new kits? Who knows, but we do know this seems to be a trend that many teams and players like to accommodate. Although many would think the looser fitting clothes would allow for better mobility and flexibility, with the introduction of compression materials that have moisture wicking materials, these are new kits can be worn as the players please. Below are the Navy/Light Blue away kits that are being introduced in late 2014 as the arrival of Puma sponsorship for 5 yrs has taken over the design and production of their kits. 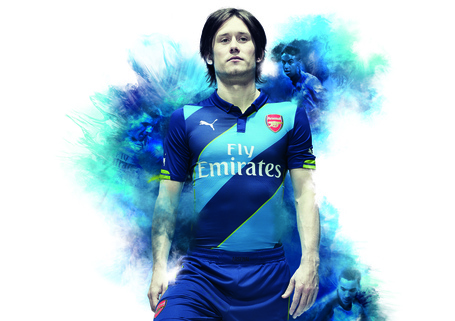 This blue kit was inspired by the 95/96 kit of Dennis Bergkamp, who wore a similarily colored kit at Highbury. This blue kit features diagonal stripes in navy and light blue colors with lime green border colors in between the sets. Many would say this kit resembles the kits of the Italian national team that were worn at the World cup.